Sunday, January 10, 2010, 3 p.m. TICKET PRICES : $30; $25 members; $20 if purchasing three or more of the Villa Chamber Music Series (Available through Montalvo Box Office only). From their twos to their 20s, the Albers sisters have been captivating audiences with musical styles as diverse as their distinctive personalities and features. 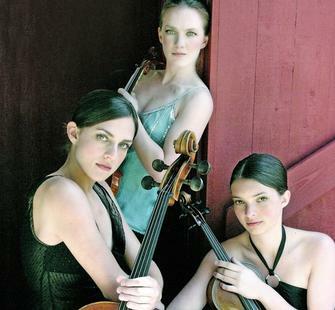 The sisters have performed at such venues as Alice Tully Hall at Lincoln Center, National Theatre in Taipei, Severance Hall, Weill Recital Hall, and Zankel Hall. Their performances have also been seen and heard on Live from Lincoln Center, Kennedy Center Honors, Japan's NHK, the Washington, D.C., Voice of America and Bavarian Radio. Violinist Laura is the associate concertmaster of the San Francisco Opera. While attending Juilliard, she toured with the Astor String Quartet and the Wild Ginger Philharmonic and also taught violin at the Diller-Quaile School of Music. In addition to the opera, she performs in the Bay Area with the Broderick Ensemble and the Empyrean Ensemble, as well as the Orpheus Chamber Orchestra in New York City and Sarasota Opera in Florida. She also volunteers for California Pacific Medical Center's Soothing Sounds program, bringing music to patients. Violist Rebecca, also a graduate of the Juilliard School, currently teaches in the Juilliard pre-college with Ms. Castleman and is a touring member of Mark O'Connor's Appalachia Waltz Trio. As winner of Juilliard's 2002-03 viola competition, she made her solo debut performing the New York premiere of Samuel Adler's Viola Concerto and the Juilliard orchestra in Alice Tully Hall. She has performed with Yo-Yo Ma and Itzhak Perlman, just to name just a few. Cellist Julie has received various awards including the Grand Prize in South Korea's Gyeongnam International Music Competition and Second Prize in Munich's Internationaler Musikwettbewerbes de ARD. She has performed with the orchestra of Indianapolis, Seattle, Colorado, Syracuse, San Antonio, and Dayton. She is currently in the middle of a three-year residency with the Chamber Music Society of Lincoln Center. Read about the Albers Trio Montalvo performance on the San Francisco Classical Voice website.